The Luxembourg Government will work with Deep Space Industries to co-fund relevant R&D projects that help further develop the technology needed to mine asteroids and build a supply chain of valuable resources in space. The co-funding will be implemented under the Luxembourg space program, (LuxIMPULSE), the national R&D support program, and using financing instruments of the SNCI. The inaugural project of this exciting new partnership is Prospector-X™, an experimental, low Earth orbit technology demonstration mission, designed to test the company’s innovative deep space technology. These key enabling technologies will be instrumental to the success of the company’s first deep space resource exploration missions in the near future. 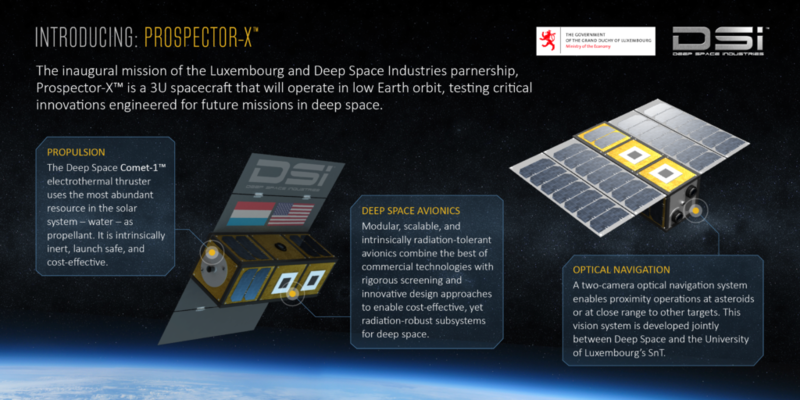 The Prospector-X spacecraft will be built at Deep Space Industries’ new European headquarters, in Luxembourg, in conjunction with the company’s international and American partners, including the Interdisciplinary Centre for Security, Reliability, and Trust (SnT) at the University of Luxembourg. Beyond this first spacecraft mission, Deep Space Industries and Luxembourg are building a long-term partnership focused on economic development through innovation in technology, policy, and international cooperation. This announcement comes on the heels of two recent NASA contract wins for the company, and a successful on-orbit experiment to demonstrate autonomous operations (an important step in building smart robots for space mining). As the world-class team at Deep Space continues to grow in the United States and in Luxembourg, the company is also working with customers and partners across the world to build a reliable supply chain of technology and resources to support the growing space industry.